I have been baking for as long as I can remember. In fact, one of my first memories is standing on a chair next to my mom in the kitchen of our tiny house in St. Louis when I was about 3 years old, peering over her shoulder as she sifted flour into a large mixing bowl. (Of course, part of why that memory sticks is probably what happened next - I got a little too engrossed in peering and toppled into the wall headfirst, ending up in the ER for stitches. But the baking part is really clear to me, too, I swear.). My childhood is full of moments like that, watching my mom bake loaf after loaf of fluffy braided challah early on the morning of our annual Hanukkah party, or cutting out cookies at Christmas, or stirring the thick batter of a cake just because she felt like making one. It's no wonder to me that I grew to love baking too, and in a deeply therapeutic way. I'm not good at painting, drawing, or really any other fine arts. But baking is my escape, and my place of creation. Woven into each of those memories, whether explicit or not, was almost always a recipe. A map of ingredients and instructions. Something passed down from a generation past, or found while rooting through the worn pages of a favorite cookbook, or even a recipe discovered online, rated and tweaked by dozens of other bakers. I have always been slightly afraid of changing recipes for fear of destroying whatever internal balance has been so delicately constructed. Even though I've done my fair share of tweaking recipes, it was always with trepidation, and without a clear understanding of what it really is that makes bread bread-y, a muffin muffin-y, and a cake cake-y. I've experimented, yes - but I've always respected the recipe. Feared the recipe, in a way. 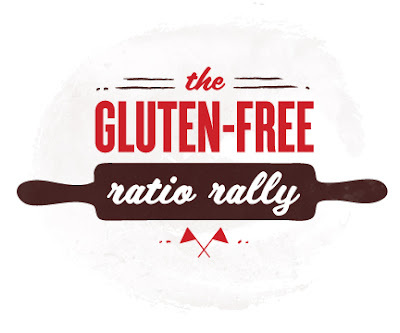 So when I was perusing my usual food blogs one day last month and came across the Gluten-free Girl's post on the Gluten-free Ratio Rally, I was immediately intrigued. Here was a group of gluten-free bloggers breaking free from the bonds of recipes to get at what really underlies them all: a simple ratio. Flour, liquid, egg, and fat - these ingredients appear in so many different kinds of baked goods, but without knowing how much of each one is in a pancake versus a biscuit, you'll have to follow a recipe. Once you know the ratio at work, though, the world of gluten-free ingredients is your oyster. As long as you measure each class of ingredient in the proper ratio by weight instead of volume (using ounces or grams instead of cup measures), you can create new recipes to your heart's content, using whichever flours and flavors you want. You can reshelve your cookbooks. That's right - you can create recipes. Seriously. The idea of baking from a ratio of weights makes so much sense when you think about it. As bakers, we all measure things slightly differently. The weight of my cup of flour may be quite different from your cup of flour, depending on how much the flour settles. This is especially in gluten-free baking, in which so many different kinds of flours are used; the weight of 1 cup of sorghum flour will be very different from 1 cup of potato starch, for instance. The amount of flour used in a recipe can therefore vary quite widely if it's measured by volume (cups) instead of by weight. Last month, the Gluten-Free Ratio Rally bloggers took on pancakes as their challenge, and the recipes looked fantastic. Just check them out and see what creativity can be unleashed when you're free to roam beyond the page of a cookbook. So this month, I'm joining in the fun and have created my own recipe for you, for muffins. Not just any muffins, though. Really, really awesome muffins. And what I can't get over is how I can honestly say that I created these. Using Michael Ruhlman's ratio for quickbread and muffins (2 parts flour: 2 parts liquid: 1 part egg: 1 part fat), I just....made it up. I won't say that it was a seamless ride to the finish line. These underwent a few different iterations before I finally settled on the recipe I'm posting here. My first attempt was pretty tasty, but had a somewhat dense texture that I wanted to lighten up. It also relied mainly on starches and refined grains, and I wanted to strike a healthier balance with whole grain flours instead. The second attempt was an utter fail involving a fatal overdose of xanthan gum and too much liquid, which resulted in a gummy mess that puffed up nicely at first, tricking me in the first 30 minutes of baking, only to deflate back into itself, stubbornly refusing to rise again. But the third attempt - the third attempt was a keeper. I kept several elements the same, using pineapple juice as part of the liquid (don't worry, it's not something separate you have to buy, as long as you buy crushed pineapple in 100% juice) and substituting applesauce for half the fat. I did tweak a few things from the first recipe, though: reduced the xanthan gum, added some baking soda, and used a little less crushed pineapple in the batter. I substituted brown rice flour for white rice flour. I increased the amount of each extract, too, so that the piña colada flavor shines through unmistakably. And I frosted them with a simple coconut-rum glaze and toasted coconut. You could take my word for it and believe that these are amazing. I had to give them all away for fear of eating every last one myself. But in case the bias in that opinion is (understandably) too much for you, maybe I can share what my classmates and friends said when they tried these. "Oh, my GOD," was the most common refrain of disbelief uttered after the first bite. They couldn't believe these were gluten-free, and they all agreed that they tasted just like their namesake. "DEE-licious!" read an email from another friend who tried these. I could go on, but you get the idea. They're good - really good. The inside came out moist, soft, and wonderful. And they really do taste like a piña colada, with the rum, coconut and vanilla extracts complementing the sweetness of the real pineapple chunks perfectly. These are seriously addictive, and so delicious that you can safely serve them to non-celiacs without any backlash about their being gluten-free and dairy-free (Now that I think about it, I believe I was the only celiac who tried this last batch, but everyone loved them!). So, because this recipe is the first one I've made up this way, I am especially excited to share it with you. I hope that you enjoy them! For a list of all the other fabulous recipes for muffins and quick breads that the Gluten-free Ratio Rally bloggers came up with this month, visit Sylvana's Kitchen. *Note: All measurements are given here in weight, but you only need a very inexpensive, simple scale to weigh these ingredients because they are all in multiples of 2 ounces. I have a scale from Target that cost maybe $5 that I used for this. Originally, I was measuring out approximations of how many cups each ingredient would have, but they were all such strange measurements (i.e. "somewhere between 1/4 and 1/3 cup of sorghum flour") that I decided against including that here. But suffice to say, overall, I ended up with about 1 3/4 cups of flour in the end using this combination. I highly encourage you to weigh out each one for best results, though! *One other note: I bought a 20 oz. can of crushed pineapple in 100% juice for this recipe and used it for both the crushed pineapple and the pineapple juice. I definitely had some leftover, but the smaller 6 oz. cans will not be enough. So I'd recommend just getting the larger size and having the leftovers as a snack. Preheat the oven to 400 F (You'll reduce the temperature to 350 F after you put the muffins in, but this cushions it against the heat that escapes when you open the oven). Line a 12-muffin pan with paper liners or grease with cooking spray. Using a kitchen scale, measure out the sorghum flour, brown rice flour, tapioca starch, potato starch, sugar, and shredded coconut. Whisk together in a mixing bowl with the salt, baking powder, baking soda, and xanthan gum until well combined. Weigh the So Delicious Coconut Milk, pineapple juice, and applesauce and whisk together in a separate bowl with the eggs and melted butter. (Be sure to let the butter cool a bit before adding it so you don't partially cook the eggs!) Add the vanilla, coconut, and rum extracts and continue to mix very well. Add the liquid ingredients to the dry ingredients and beat by hand to mix until all ingredients have been incorporated. Add the 4 oz. crushed, drained pineapple to the batter and mix in. Pour about 1/3 cup of batter into each muffin tin, distributing the batter evenly among the 12 tins. Sprinkle some of the pineapple-coconut-brown sugar topping on each muffin and press down slightly to get them to stick. Place the muffins into the oven and immediately reduce the temperature to 350 F. Bake for 25 - 30 minutes, or until a toothpick or knife inserted into the center of the muffin comes out clean (I baked mine for exactly 29 minutes, but your baking time may vary depending on the oven and altitude). Remove from oven and leave in the muffin tin for another 5 minutes or so before removing to a wire rack to cool completely. If you try to take them out and they are still too delicate, leave them in the muffin tin until you can take them out without crushing/crumbling them. When the muffins are completely cooled, drizzle with the coconut-rum glaze and top with toasted coconut (if desired). Serve immediately or store in the refrigerator until ready to serve. If you can wait that long. Hmmm... these look amazing! I can relate to your excitement about creating recipes, its great to see what you're capable of and turn out something that makes people happy when they eat it, especially if they're not gluten-free. That first photo had me. My mouth was watering by the time I got to the ingredients. Looks amazing! Pineapple and coconut are two of my most favorite things - I am just starting to try dairy free baking (been gluten free a long time). I will be trying these - those photos are fabulous. Thanks! WOW! These look spectacular! I'm with Lisa. Pineapple and coconut are also two of my most favorite things. Thank you so much for listing vegan options. We don't eat gluten or animal products at our house. These will be great washed down with a tall glass of So Delicious Coconut Milk! YUM! Oooh I love your first photo, just makes me want to try these right away! So glad you're participating! I feel so honored to have been a test dummy (and adviser) for this recipe. Woot woot! Thanks for all of the comments, everyone! Lisa and Christie: Pineapple and coconut are two of my most favorite things, too! And I'm so happy that you'll both be able to make these even with the other foods you avoid. I hope you enjoy them! Jenn: Thank you - I am so excited to be involved, too! oh, i'd be so happy to have one of these in front of me right now! that first photo is a keeper... love the drippy icing and chunky coconut. yum-mee. These are seriously fantastic-looking muffins. And I love the fact that you never have to fear a recipe again! Tara: Thank you - I love that the recipe fear is gone, too. Such a liberating feeling! These muffins look great! I wish I lived closer so that I could come try them right now. Thanks for sharing this great recipe in our Rally! Enjoy your weekend. Thanks, Amie! I loved your recipe, too, and as soon as I can lay my hands on some fresh apricots, am looking forward to trying it out for myself. And if you're ever in Boston, definitely stop by for a piña colada muffin :) Have a great weekend! Hi Melanie, thanks so much for your comment! I can't wait to hear what you think of these if you try them out. If you're a pineapple and coconut fan, I have a feeling you'll love them :) Take care! These made me so hungry yesterday. I actually got some cookies that tasted similar to how they look. Can't wait to get some pineapple in the house. Brooke, I hope you get some pineapple in the house soon so you can try them out! In the meantime, I hope the cookies satisfied the craving for now :) Take care! I made them yesterday and loved them! they are even better today! I replaced the toppings with a buttercream icing with a little coconut flavour as my kids would never go near anything remotely tofu-ish!! Still fabulous! Thanks for the recipe - it will be an enduring family favourite for us! Saskia, I am so glad that you and your family enjoyed these as much as I did! I'm sure your variation with the buttercream icing was fabulous - might have to try that one myself next time. Thanks so much for your comment, and take care! What brand of coconut etract did you use? I can't seem to find one that doesn't taste artificial or like nothing at all.